GIS market size was estimated at over USD 4 billion in 2017, growing at a CAGR of over 12% between 2018 to 2024. The GIS market is projected to exhibit a lucrative growth between 2018 and 2024 due to the increasing demand of location-based analytics among the businesses to improve operational efficiency and enhance the decision-making process. The growing need to integrate conventional data with the spatial data to obtain valuable insights from location-based information will offer new growth avenues for the geographic information system market over the forecast timeline. The penetration of the IoT platforms in business operations has fueled the generation of real-time location data for offering highly relevant and location-specific service to the customers. Another factor contributing to the market growth is the government-led initiatives towards the growth and development of the smart cities which will lead to an increase in demand for GIS technology for enabling a highly connected urban infrastructure. For instance, in January 2017, the central government in India announced its plans to utilize geospatial technologies for smart cities project. To realize its vision to build 100 smart cities across the country, the Indian government is aiming to use geospatial technology which enables effective and integrated planning through the use of real-time location data analytics. The mobile GIS software market is expected to register a CAGR of over 18% during the forecast timeline as it offers the users an easy way of acquiring and uploading GIS data to the online visualization tools such as Google Earth. The mobile GIS technology provides a cost-effective way of collecting geospatial data and helps to improve the quality and speed of data collection while reducing errors. The increasing demand for mobility solutions that offer GIS users a much simpler experience with the creation of apps to collect and explore the data is projected to drive the GIS market growth. The telematics and navigation applications are expected to exhibit a growth rate of over 17% during the forecast timeline. With the growing number of connected cars, the vehicle-generated information such as the data related to braking systems and vehicle diagnostics plays an important role in delivering modern telematics and navigation solutions. As the navigational and telematics systems use data related to geoinformatics for tasks such positioning and vehicle & traffic management, the need for GIS software for assisting connected cars and autonomous vehicles is likely to increase significantly from 2018 to 2024. The government agencies are expected to show the greater adoption of the GIS software implementation. Increasing government investments across military and aerospace sector is driving the demand for advanced location-based technologies resulting in increased demand for GIS solutions. Government authorities are rapidly deploying GIS technology for spatial analysis to make better data-driven decisions regarding the welfare of the state and nation as a whole. The defense agencies utilize the geospatial information to carry out their crucial surveillance and reconnaissance operations, including battle field management, terrain analysis, and monitoring of possible terrorist activities. As the spatial data is of crucial importance to military operations, the demand for GIS technology in the government sector will increase swiftly during the forecast period. 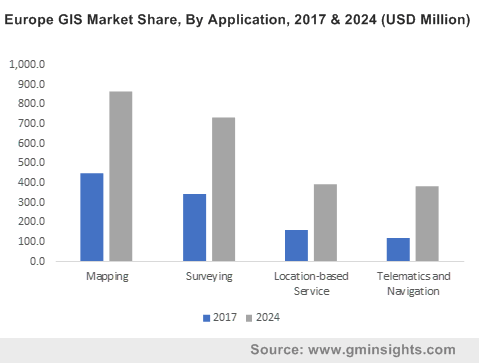 The North America GIS market held a major share of over 40% in 2017 and is projected to hold a significant market share by 2024 due to the increasing government-led initiatives contributing towards the growth and development of the region’s geospatial industry. For instance, in June 2018, the U.S. Air Force awarded a contract of USD 130 million to SpaceX for the launch of Air Force Space Command Satellite (AFSPC)-52 satellites in the late FY2020. Another factor accelerating the market growth is the higher concentration of the GIS solution providers in the region. These players are offering the most powerful mapping and spatial data analytics technology and are dedicated to provides GIS professionals and surveyors with necessary tools and modern software to assist them in conducting surveys. The competition in the global GIS market is characterized by various strategic initiatives such as new-product development and partnerships adopted by the global technology companies and GIS solution providers to develop products and services to cater to the customers’ requirements. For instance, in July 2018, Leica Geosystems partnered with GeoPal to support high accuracy asset data capture for utility professionals within the GeoPal mobile workforce management solution. The Leica Zeno GG04 Plus smart antenna supported by GeoPal provides high accuracy positions within the GeoPal’s android and iOS mobile applications. Also, in May 2018, Amnex Infotechnologies entered into an agreement with Hitachi India and Tokyo-based Hitachi Solutions for product development and penetrated the geographic information system market for GIS and IT based solutions. 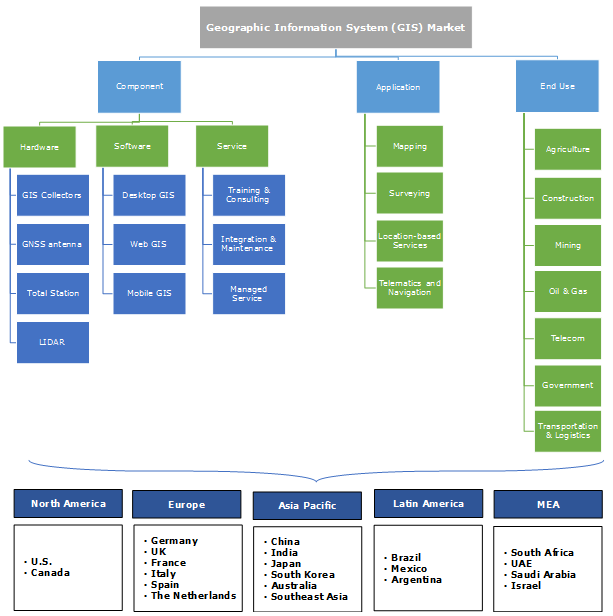 Some of the key players operating in the GIS market are Autodesk, Bentley Systems, Pitney Bowes, Supermap, Schneider Electric, ESRI, General Electric, Pasco Corporation, Trimble, Hexagon, Topcon, MacDonald, Geoinfo, Geosoft, Harris Corporation,Hexagon, Hitachi Solutions, MDA Information Systems, Pitney Bowes, and Unistrong. The penetration of GIS solutions in various verticals, including defense, construction, transportation, and disaster management for mapping and surveying purposes is expected to drive the market growth. The growing trend of location-based technologies and the proliferation of connected devices will increase the demand for GIS software among the businesses to manage and analyze the geospatial information to improve business decision-making. The government agencies around the globe are also spending heavily in developing advanced spatial infrastructure which is further triggering the demand for positioning and navigation systems. To cater to the needs of the surveyors and GIS professionals, the GIS solution providers are strengthening their product portfolio by either investing in their research and development activities or by partnering with other companies to develop the innovative products.